While Mayor Martin Walsh and City Councillor Tito Jackson have dominated most of the conversation in this still-young campaign season, a third candidate has quietly locked down enough verified signatures to force a mayoral run-off election in September. Joseph A. Wiley, a 68-year-old Roxbury native, is working through the mechanics of his first run for office, saying the city needs a better approach to affordable housing in the face of a massive development boom. President Barack Obama inspired Wiley to look to himself as a potential catalyst for political action. Wiley, a gay man of color, grew up around Roxbury— “Dudley was sort of my playground when I was a kid” — and has lived across Boston in his decades in and out of the city. 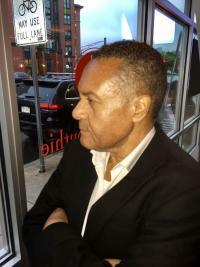 He’s called Dorchester, Mattapan, Back Bay — “when it was affordable” — and, for the last 20 years, East Boston his home. After attending Boston English High School, Wiley started but did not complete a degree at UMass Boston. He had caught the theater bug and moved to San Francisco for an acting program. After a year and a half of the two-year program, he decided he’d learned about all he could. California remained Wiley’s base for a spell, after which he moved back to Boston. In 1981, he moved to New York City, where he would live in Manhattan for the next 14 years. But Boston called again, and Wiley, then in his mid-40s, moved home. After spending 12 years in the commercial real estate field, Wiley now works in health insurance. He has been an East Boston resident for two decades, with life in three of the country’s most expensive housing markets under his belt. The “piecemeal” manner in which Boston deals with affordable housing, Wiley said, is inadequate. Politics has always been of keen interest to Wiley, he said. After years of reading and watching, he took out papers to run for mayor in 2009. This time around, with Walsh running for his first mayoral reelection, Wiley sees a second chance. It is tied to general issues of affordability, he said, noting that nearly half of Boston residents make less than $35,000 per year, according to 2016 city data. “What they’re doing, god only knows, how are they possibly surviving?” he wonders. He’s also skeptical of the kinds of metrics showing high approval for the way the current administration is being run. So in his first full run at the post, Wiley said he is working on the mechanics of the campaign, getting a website together, honing his platform, and assessing the terrain. He is a novice as far as running for office is concerned, but said he has studied different politicians and political approaches through his life.